Your hair’s natural oils give your hair texture and make your strands more moldable. So if you plan on curling your hair, don’t wash it for a day or two. If your scalp feels too oily sans shampoo, sprinkle a little dry shampoo along the roots and leave the rest dirty. Deep conditioning treatments have a tendency to weigh hair down and make it harder to style. So if you know you’ll be curling your hair, stick to a lightweight conditioner and save the more intense hydrating treatments for another day. Many people make the mistake of piling on products after curling and using nothing before. But stiff, crunchy curls are not the goal here. So before you take a curling iron to your mane, start with a lightweight styling lotion to give your hair some texture. It’s also a good idea to use a heat-protecting product so you don’t fry your strands. Once you are done curling your whole head of hair, finish by misting your curls with a light hairspray (I recommend Elnett Volume Extra Strong Hold). Use just enough hairspray to make your strands stay without feeling stiff. Having the right tools makes all the difference. To begin, make sure you’ve selected an iron with the right size barrel. For hair that doesn’t hold a curl well, I recommend a ¾-inch barrel. The curls will be tight without looking ringlet-y, and will loosen as the day goes on. If your hair holds a curl better than mine does, choose a 1-inch iron for instant beachy waves. Also, if your hair always falls flat, consider investing in a professional grade curling iron. For a long time I was trying to curl my hair with a drugstore brand, and it was only when I switched to a higher-end iron that I realized my hair could hold a curl. I recommend a NuMe curling wand or the Sarah Potempa Beachwaver if you’re willing to invest, or Hot Tools to get the most bang for your buck. When in doubt, I always turn to this curling method recommended in Lauren Conrad Beauty: Once you release your hair from the iron, simply pin the curl to your head until it sets. Once your entire head is pinned, mist it with hairspray. Then, carefully unpin your curls and comb through them with your fingers. This timesaving trick is the one I use most often. If you know you’re going to curl your hair the next day, sleep with it in a braid or two (depending on how thick your hair is). The next morning you will wake up with instant textured waves—the perfect canvas to take a curling iron to. Do you have any tricks you use to curl your hair? I hope that all of these tips help! P.S. 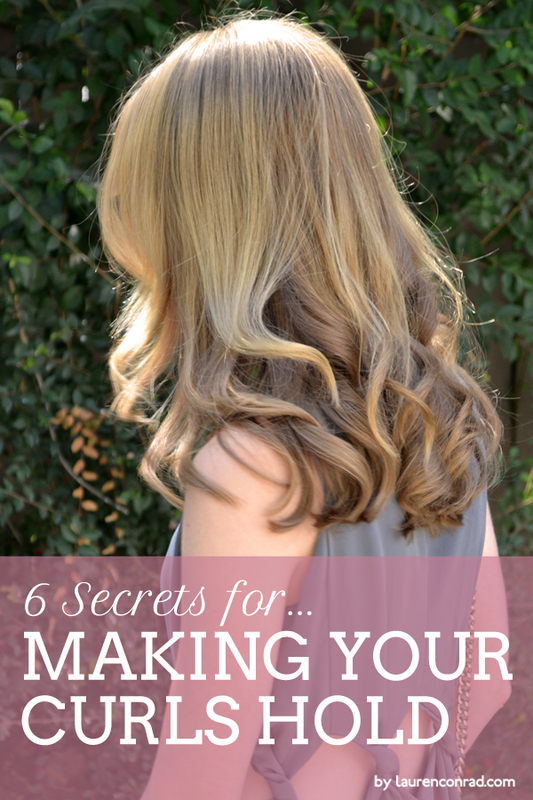 If you’re looking to grow out your hair, check out my advice for making your hair grow faster. Do I Need to Detox My Hair?